Cask; Seasonal - Christmas. Also available bottle conditioned. A rich winter beer fermented over 7 days to give a pleasant dry finish. Brewed in October to give 8 weeks cask condition and allow the flavours of crystal and chocolate malts; roast barley; and Northdown and Fuggle hops to mingle. Not your run of the mill sweet sticky winter warmer. UPDATED: FEB 14, 2019 12/2/2019. 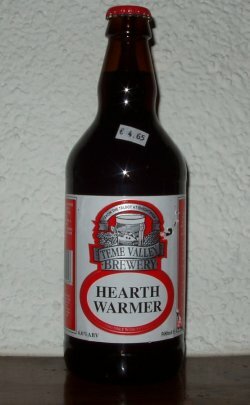 Bottle from Tuffins Supermarket, Craven Arms. Pours clear dark amber with a small off-white head. Aroma of malt, light roasting, hint of chocolate, caramel and fruit. Moderate sweetness and medium bitterness. Moderate body, slight oily texture, average carbonation. Slight watery finish, otherwise a decent brew. UPDATED: FEB 12, 2019 Bottle from Tuffins, Craven Arms. Nice head with good duration. Color is brown. Aroma and taste are caramel, fruits, hops, malt and has a light nutty finish. Malt and dark sugar, burnt sugar, caramel, tofee, a long finish with some bitterness and spice. Some woody, earth notes - decent festive beer. Light beige frothy head left a cover on a rich oak coloured still body. Malt & dark sugar aroma. Thick, cloying & a slight fizz on the back. Malty burnt tastes to the fore with caramel & toffee followed by a long tangy back of hops & citrus. A good twist on an English Bitter. Bottle from local co-op. Dark Amber beer with large foam head. Aroma of malts, earthy, nutty and toffee. Taste is malty, dark chocolate, nutty and some earthiness with a sweet finish. Good. Bottle thanks to AshtonMcCobb. Pours hazy darkish brown. Nose is sweetish malts, some wooden and nutty notes. Taste is nutty, malty, some citrus. Bottle at the School’s Out Tasting. Pours hazy brown with a thin beige head. Aromas of soap, like all the other Worcester beers, some nuttiness,some dung. Taste is light sweet, nutty, sweet finish. Bottle from Saucy Pears. Appearance - amber brown with a thin head. Nose - nuts and oranges. Light malt background. Taste - orange and brown blended, dry orange finish. Palate - medium bodied with a tangy texture and a long tangy finish. Overall - solid but still a yeasty edge.